The U.S. military “launched dozens of cruise missile strikes against an airbase controlled by Syrian leader Bashar al-Assad’s forces” on Thursday, “in response to the chemical attack on Tuesday in a rebel-held area.”  As of this writing, it is unclear whether there will be further military action. Now there are different opinions extant on who is responsible for the chemical attack that gave rise to this U.S. response, many of them out of proportion to the access to actual intelligence information available to the proponents. And while the use of chemical weaponry on the part of Bashar al-Assad seems like an astonishingly irrational act of snatching defeat from the jaws of victory at this point in the Syrian civil war, we do ourselves a disservice if we use that incongruity to avoid seeking the proper application of Catholic teaching to the situation at hand with the assumption that the U.S. position on what took place is the correct one. 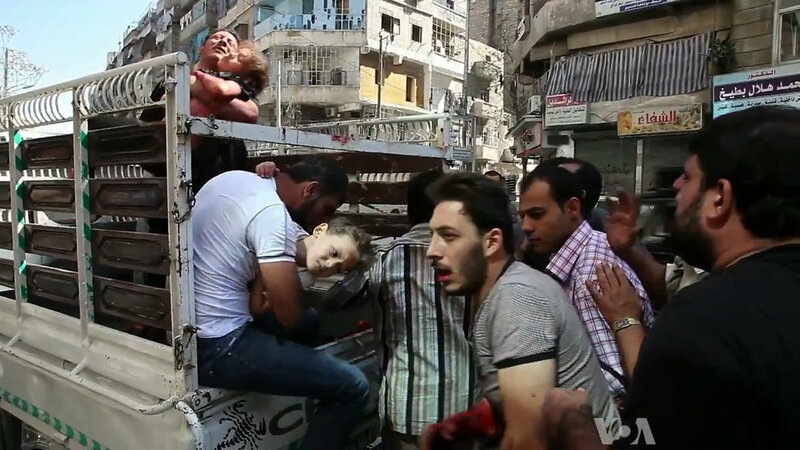 The question is, simply put: if the Syrian regime attacked its own citizens with chemical weapons, is a military response on the part of the United States justifiable under the Catholic just war doctrine? “All citizens and all governments are obliged to work for the avoidance of war. “- the use of arms must not produce evils and disorders graver than the evil to be eliminated. The power of modem means of destruction weighs very heavily in evaluating this condition. “These are the traditional elements enumerated in what is called the ‘just war’ doctrine. The underlying premise of the just war doctrine is that nations must be allowed the right of self-defense. But that is because there is no “no international authority with the necessary competence and power.” It follows that the United Nations should be utilized to the extent possible. The UN may well prove unable by itself to have any serious preventive effect, but it ought to be looked to as a first resort if time and circumstances permit. In this case, the United States has acted unilaterally, and does not appear to have sought even so much as UN Security Council authorization. Moreover, the teaching is that “governments cannot be denied the right of lawful self-defense,” not that they may utilize military force every time they are outraged. As horrific as the outcome of the chemical attack in Syria was, there is simply no question here of the United States acting in self-defense. The U.S. is not threatened by Syria. Now since the premise of the just war doctrine is that a nation is entitled to defend itself, the four “strict conditions” that are listed for purposes of assessing just war compliance must be analyzed in that light. Self-defense is a presumed requirement in order to pass muster under each condition. What’s more, each of the four conditions must be satisfied at “one and the same time….” Satisfying even three of the four is insufficient. The first of the four conditions is that “the damage inflicted by the aggressor on the nation or community of nations must be lasting, grave, and certain….” The “nation” here, refers to the nation that is defending itself. The Assad regime is certainly inflicting serious damage on its own country, whether it is using chemical weapons or not. But it is not inflicting any damage on the United States. This doesn’t mean that the U.S. or any country has to wait until it is invaded before it may legitimately engage in military action. The required damage inflicted by the aggressor may also be brought to bear on the community of nations. This means that the U.S. would not be required to ignore its treaty obligations if a NATO country was attacked simply because no shot was fired across its own border. But Syria is engaged in a civil war. This is not a case of Syria invading any country other than its own. The “community of nations” is not being threatened due to any action by the Syrian government. The just war analysis of the U.S. military action fails as to the first condition. Now the fact that the U.S. action is not in self-defense, and fails the test of the first just war condition, is sufficient to remove the possibility that it is justified under the just war doctrine. This is important, because it is arguable that the action potentially passes the test under the other three conditions. There was already an understanding in place that Syria had rid itself of its chemical weapons, so other means of putting an end to Syria’s use of chemical weapons have proven ineffective. There was every reason to think that the limited military action would be successful, and, as of this writing, it appears that it was. Moreover, if there is no further military action by the United States, it cannot be said that attacking an airbase is a disproportionate response to the use of chemical weapons on civilians, to include children. But all four conditions must be met. And all four conditions have not been met. 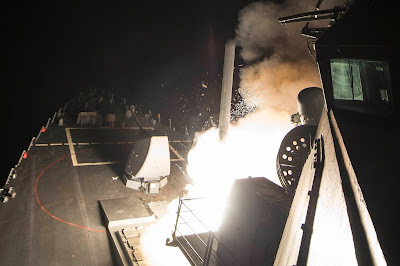 Now it will be pointed out that the moral legitimacy of such military actions belongs “to the prudential judgment of those who have responsibility for the common good.” That’s true, and that is why the sailors aboard the ships that fired the Tomahawk missiles are not chargeable with sin. Military personnel have a right to anticipate that they have received just orders (though this goes only to the decision to go to war itself, not the commission of atrocities in the course of war, such as torture, for which those who participate on all levels are morally chargeable). But this doesn’t mean that the decisions of political leaders to go to war are immune from all moral assessment. On the contrary, since the decision belongs to them, they are precisely the ones who are accountable. Does this mean that the United States should stand idly by while atrocities are committed in view of the whole world? Not at all. But we must not think of ourselves as idle if we are not engaged in military action. First and foremost, perhaps the level of atrocity that gave rise to this military action might bring home to us the dire circumstances confronted by people in Syria. And that, hopefully, will inspire us to elevate compassion over fear when it comes to the admission of Syrian refugees. In 2012, the CIA began involving itself in the distribution of arms to Syrian rebels. 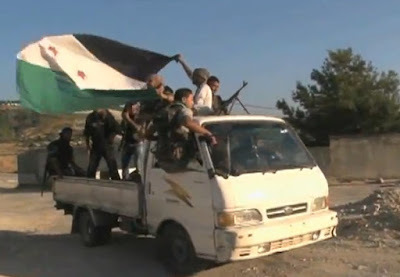 While this did not amount to the U.S. directly supplying lethal aid to rebel forces, it did involve “helping allies decide which Syrian opposition fighters across the border will receive arms to fight the Syrian government,” including such weapons as “automatic rifles, rocket-propelled grenades, ammunition and some antitank weapons.” That same year, the Syrian Support Group, a U.S. group supporting the Free Syrian Army, received authority from the United States Treasury Department “to provide logistical and financial support to the armed Syrian resistance.”  Finally, after the Obama administration had determined that the Syrian government had “deployed chemical weapons against opposition groups, crossing what President Obama had called a ‘red line,’” the U.S. started to “provide direct military aid to the Syrian opposition groups for the first time.”  In 2015, documents were “released by the US government’s Federal Business Opportunities (FBO) website” providing “an indication of the types and numbers of Eastern European weapons and ammunition the United States” was “providing to Syrian rebel groups as part of a programme that” continued “despite the widely respected ceasefire in that country.”  All of this against a country that had not attacked the United States or threatened it in any way. The United States is of sufficient power to be a credible mediator of peace, if only we could muster the will to do so and maintain neutrality among warring forces that do not threaten us. And one suspects it would be a much more effective way of doing something about the tragedy in Syria then firing Tomahawk missiles.